On election day, GetUp members will be handing out over a million how-to-vote cards to voters in key marginal electorates. GetUp's How-To-Vote cards tell voters how to number their ballot for the best outcome on a given issue, such as more funding for hospitals, renewable energy, and a fair and transparent democracy. In all strategic decisions, our guiding principle was to help GetUp members have the greatest electoral impact on the issues members care about most. Because it's not just about making our voices heard, it's about making them matter. To learn more about our methodology and research, read on. What is GetUp handing out on Election Day? 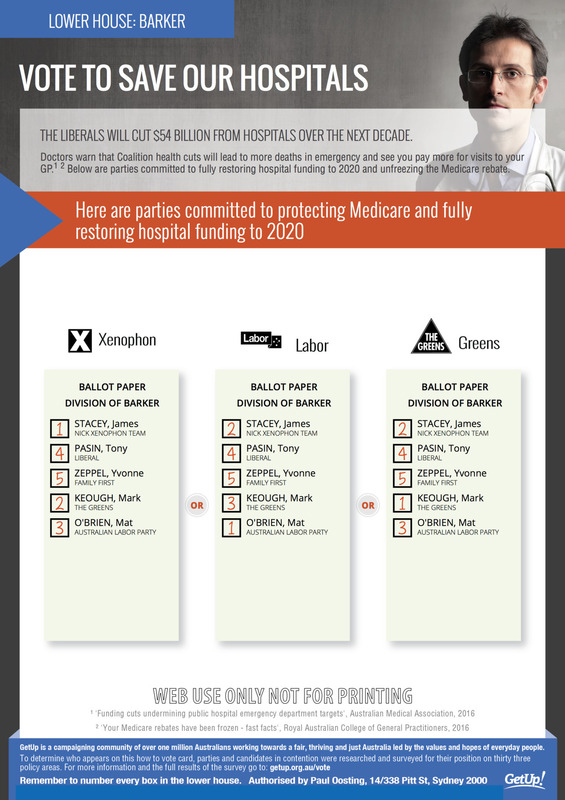 This election, GetUp members will be handing out GetUp's independent, issue-based How-To-Vote cards. How-to-vote cards tell voters specifically how to cast their vote on a given issue. The featured issues reflect a combination of priorities identified by the GetUp movement and issues important to local swing voters, identified through polling and voter research. For example, if swing voters in a particular marginal seat or senate race care most about hospitals funding, the How-To-Vote cards in that area will tell voters how to number their ballot to get the best outcome for hospitals. This ensures GetUp's How-To-Vote cards will have maximum electoral impact. Testing has shown that How-To-Vote cards have a much bigger impact on voters than a scorecard that tells voters where the parties stand across a variety of issues. How do you know How-To-Vote cards work? In the 2015 Queensland state election, the polls showed that Premier Campbell Newman would win. GetUp members were sick of what his government was doing to our Reef, so they hit the polling booths on election day to hand out issue-based How-To-Vote cards highlighting the parties with solid or strong policies on the Reef. 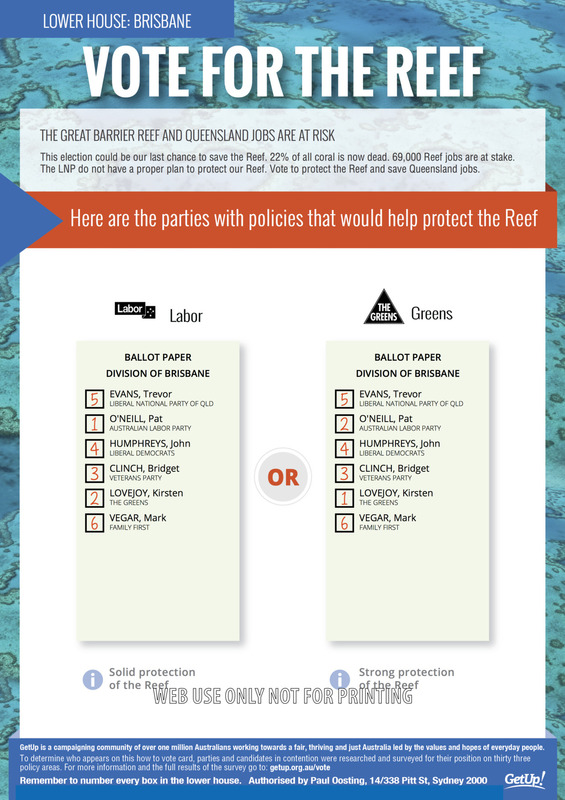 An independent analysis showed GetUp's How-To-Vote effort influenced the outcome in 7 out of the 9 marginal seats we targeted, determining who was able to form government in a knife-edge Queensland election. How did you pick which issues were featured on your How-To-Vote cards? In early 2016, the GetUp strategy team surveyed the GetUp movement on the issues that matter most to them this election. The featured issues in a given electorate reflect the combination of these priorities, and issues important to local swing voters, identified through polling and voter research. How did you pick which parties were featured on your How-To-Vote cards? 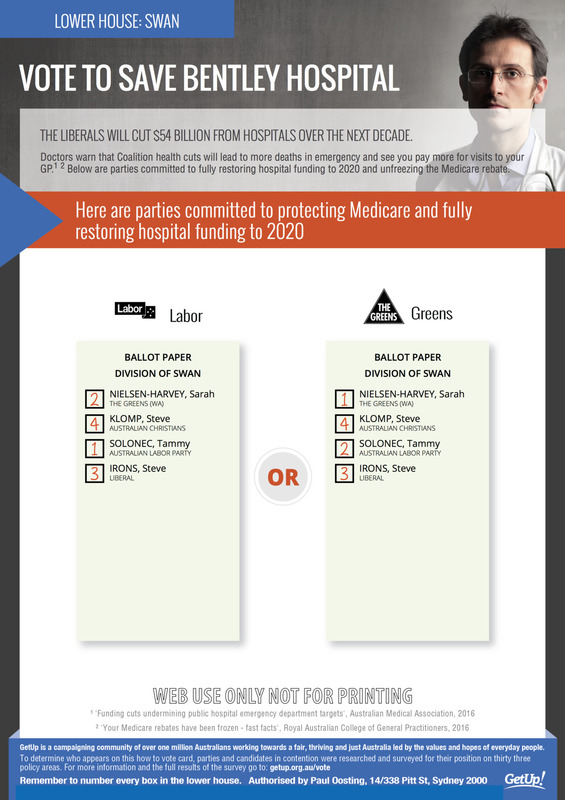 GetUp's How-To-Vote cards do not feature every political party, nor do they give a comprehensive review of each candidates' policy positions. Instead, we prioritised the candidates with the best chance of winning, who are also strong on the issues that the GetUp movement cares about. Parties and candidates were deemed to be 'in contention' for a seat based on winners at previous elections, parties currently represented in the Parliament, and close runners up. Where possible, we conducted polls to inform our decisions on which candidates stood a chance of being elected, in both the House of Representatives and the Senate. It would be great to feature more parties and more candidates on our cards, though including everyone would lead to a very complicated final product. 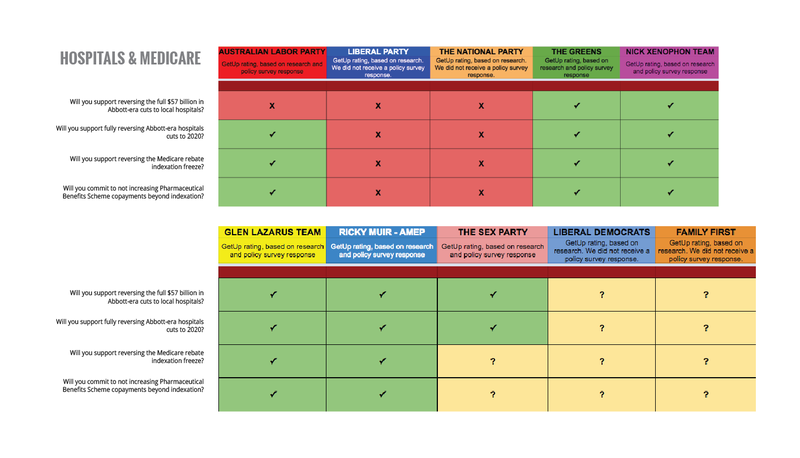 How did you rank the parties order for your How-To-Vote cards? For each party in contention, we conducted detailed research on parties' policy platforms. We also extended an invitation to parties to respond to our party policy survey, offering them an opportunity to tell us their stance on a select range of policy areas. To hear more about the parties and candidates platforms, check out some responses to the policy survey on this page (coming soon). How did you decide the order of preferences on your How-To-Vote cards? While we weren't able to survey every candidate and party running this election, every effort was taken to independently scrutinise the parties or candidates featured on our How-To-Vote cards. 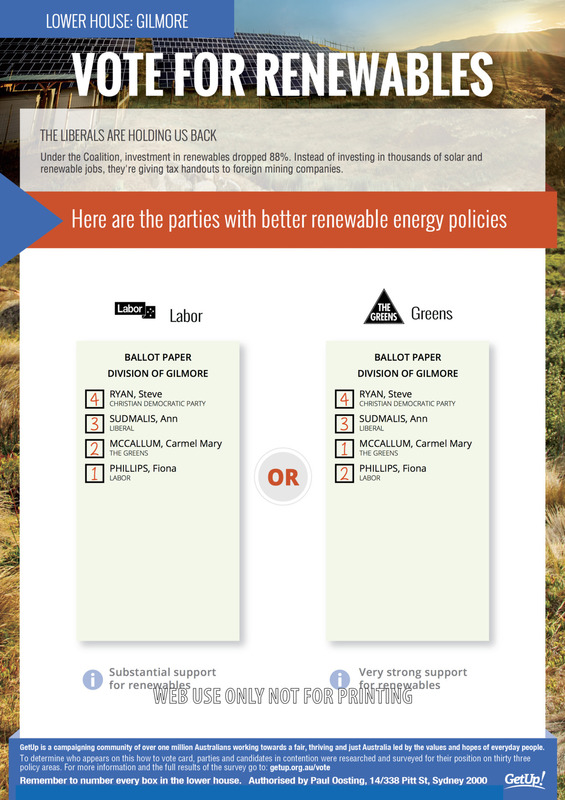 In deciding the order for the candidates, we prioritised the candidates or parties whose policy platforms are broadly aligned with the GetUp movement's core values and policy priorities. For example, candidates who are in favour of participatory democracy, equality and a renewable energy future. Is GetUp backing any candidates this election? GetUp is backing policy positions on the issues identified as top priorities by GetUp members – climate change, renewables, democracy, health and hospitals. In turn, we're giving voters information about how to support parties and candidates who support these policy positions. Some of the parties featured on our How-To-Vote cards include the Australian Labor Party, the Greens, the Australian Motoring Enthusiasts in Victoria, the Glenn Lazarus Team in Queensland and the Nick Xenophon Independent Team, as well as a number of independent candidates. Which electorates is GetUp getting involved in? Due to costs of postage and printing, we can't be everywhere this election day. Instead, we have prioritised places where we think that GetUp members can have the most significant combined impact. Our first priority is making sure that we have election day efforts in seats where the most conservative MPs or Senators who are holding back progress on our issues are running. We'll also be active in places with many GetUp members, where there's a good chance to influence the outcome of a race. 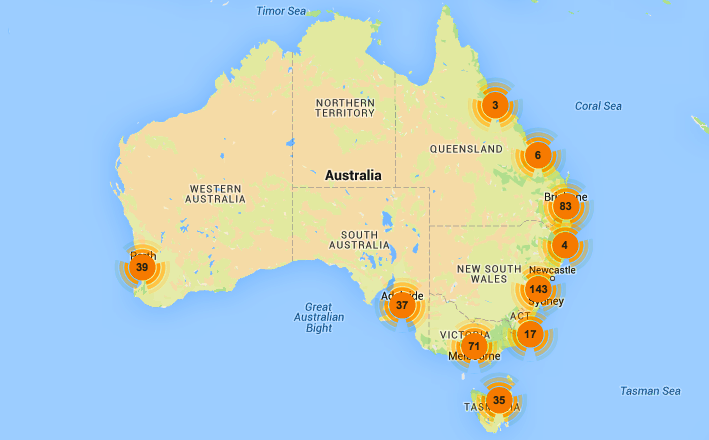 Click here to check out our target polling booths and get involved in GetUp's election day efforts. Live a long way from the action? In some areas, we have buses providing transport to target seats. Email [email protected] to hear more. Where do the parties stand on the issues? 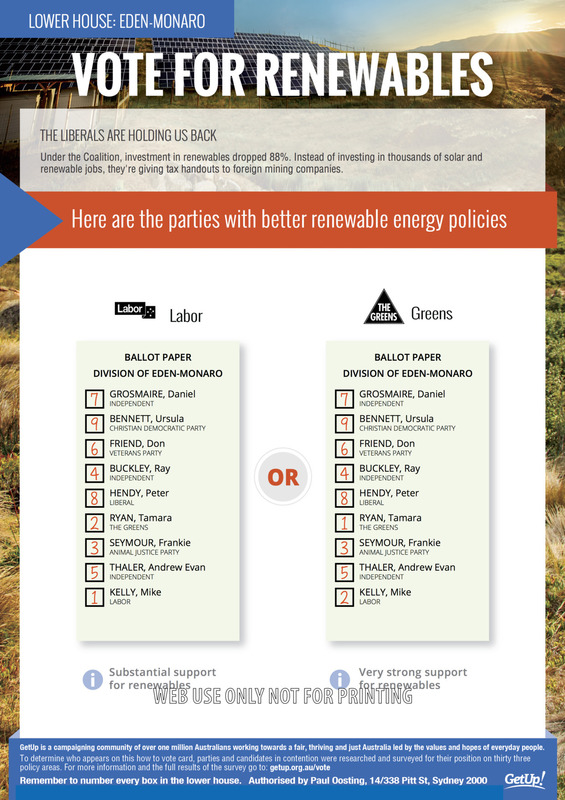 At the time of writing, the Liberal and National Parties have not responded to our survey. We have rated them based on their track records on issues and the research available to us. 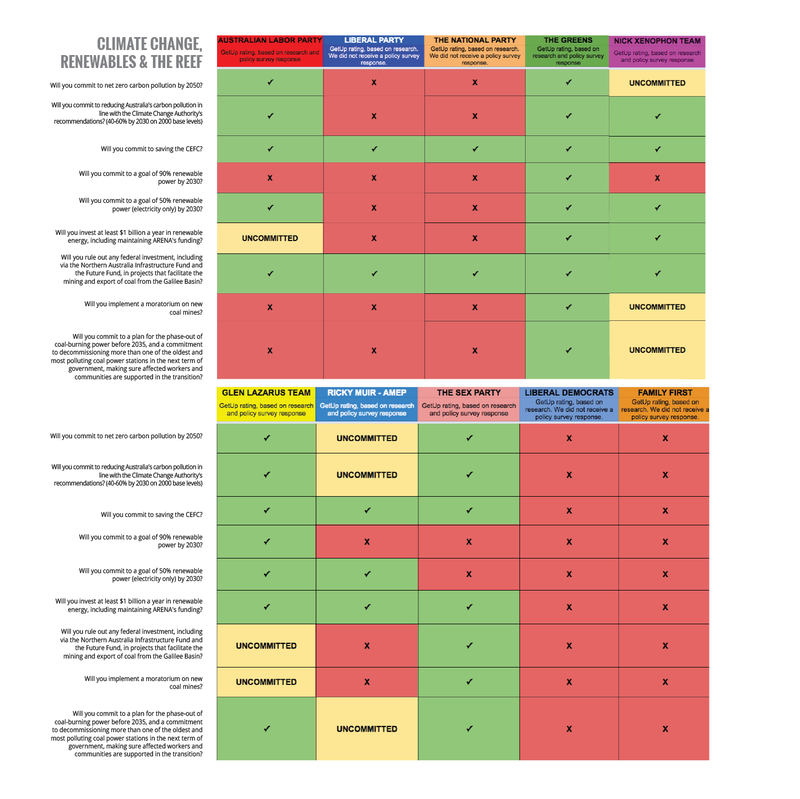 Where do the parties stand on climate change? Where do the parties stand on health and hospitals? 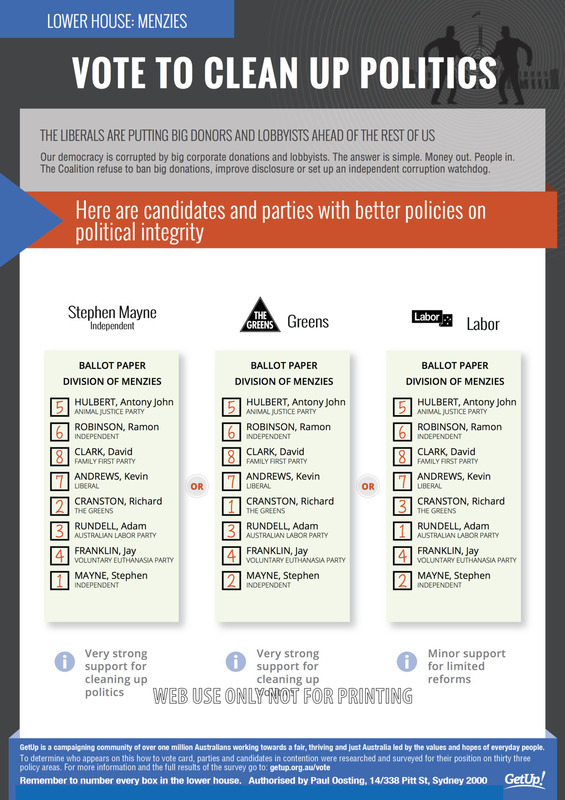 Where do the parties stand on cleaning up political donations? 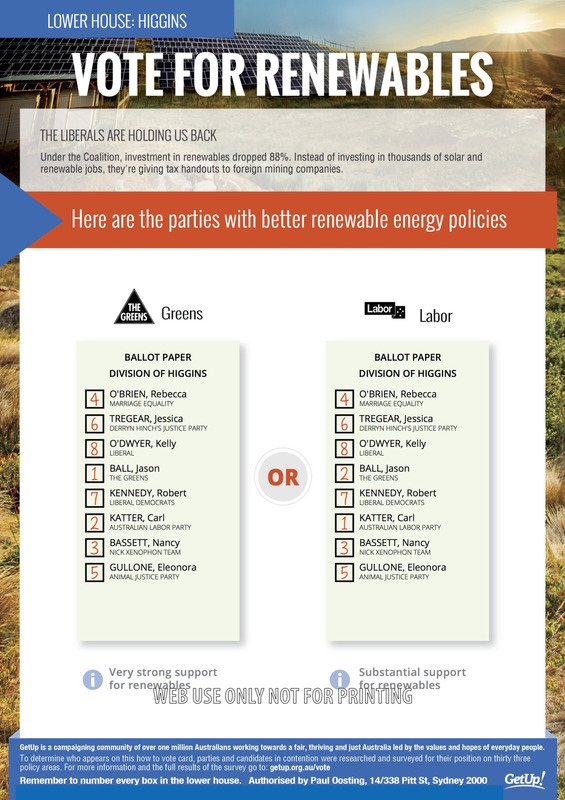 The GetUp movement is all about backing great policy - but doing so relies on policy experts, consumer groups and advocacy organisations across the country, fighting for the fairest and most sustainable policy. Earlier this year, GetUp members crowdfunded the Homegrown Power Plan. 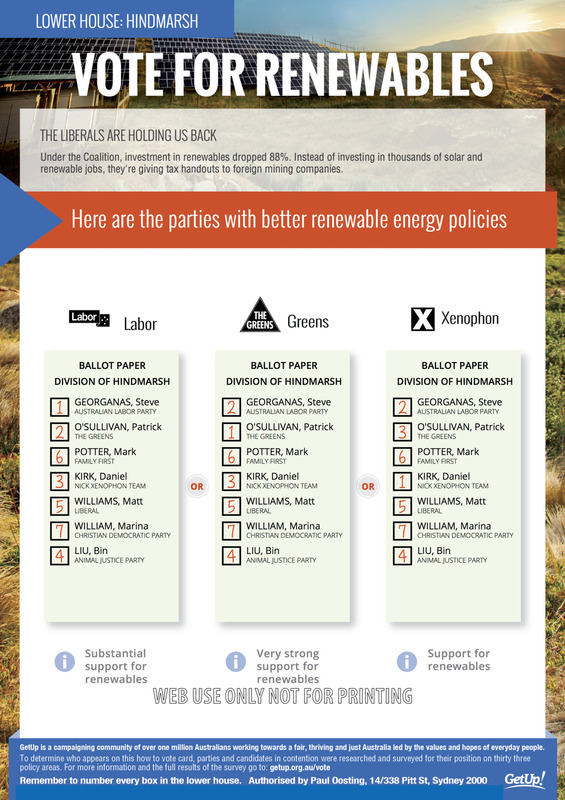 Click here to read the full report and learn what more the parties could be doing on renewable energy. Early in 2016, GetUp conducted research and surveys of political parties on their positions, across 33 policy areas. We've combined that with insights from campaign partners, further research, and announcements in the course of the election campaign. Any questions? Get in touch! Simply shoot us an email at [email protected].